FAQ – What is the Best Formula for Breastfed Infants? What is the Best Formula for Infants who also get Breast Milk? I’m not Breastfeeding – Can I Feed my Baby Formula for Breastfed Infants? In the past few years, several baby formula companies have come out with new formulas that are marketed for infants who are breastfed. This is a brilliant marketing strategy from the standpoint of the formula company, but it can create a lot of confusion for parents. When marketing interferes with a parent’s ability to make a confident decision about their baby, I get really angry. Let me tell you two quick stories that illustrate how this type of marketing has caused confusion for parents. Sarah, mom to Esther, 3 months old: Sarah’s story is actually from a colleague of mine (names are changed). Sarah sought out my colleague because she was having trouble with her breast milk supply and was concerned about Esther’s intake. (Aren’t we all at 3 months?! It’s a stressful time for every Mom!). My doctor colleague spent about 15 minutes speaking with Sarah about Esther’s feeding behavior and their nursing patterns. Something just wasn’t adding up, so my colleague asked more direct questions like, “Walk me through how a typical feeding goes, from start to finish”. 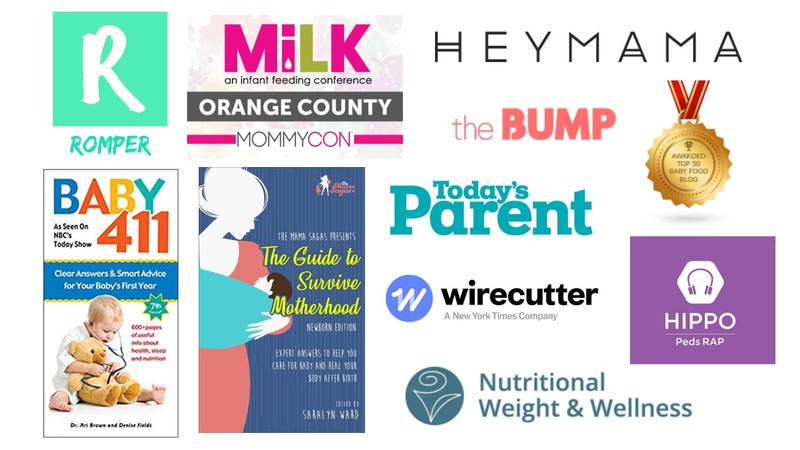 It turns out the Sarah was nursing, but she was finishing every feed by offering Esther 2 oz of a baby formula that was marketed as a breastfeeding supplement. Sarah thought this “supplement” was more like a baby multivitamin and didn’t understand that this was really a formula. This was definitely contributing to her decrease in supply. Michelle, mom to Evan 4 months old: I saw Michelle when she was considering switching her son, Evan’s, baby formula since he was plagued with terrible eczema for most of his young life, and all of his creams didn’t seem to help. 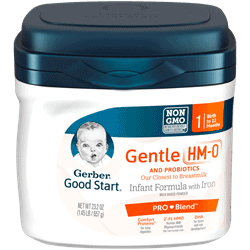 I recommended she try Gerber Good Start for Supplementing. Now, Evan had never been breastfed so Michelle was extremely concerned that he wouldn’t get enough nutrients if he were drinking a formula that was “made for babies who are also getting breast milk”. When I thought about it from her perspective, I could totally understand her concern. It made my blood boil! Remember that article I wrote about FDA regulation of the baby formula industry? Well, I explained how all formulas on the market in the USA have to adhere to certain minimal standards and be able to serve as the single source of nutrition and result in healthy growth in babies. This means there is no such thing as a formula that is only healthy for breastfed babies. Here’s another point. ALL formulas are attempts at mimicking breastmilk, so saying one particular formula is just for breastfed babies because it’s similar to breast milk is just poppycock! To hammer home my point, I am going to take you through two example formulas that we can compare. 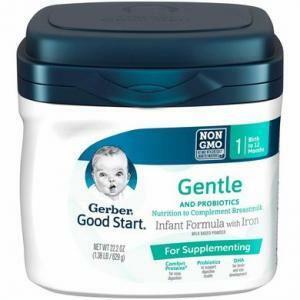 One is marketed as a standard infant formula (Gerber Good Start Gentle), the other is marketed as a supplement for breastfeeding infants (Gerber Good Start Gentle for Supplementing). Let’s compare the ingredients (cause that’s all that matters!) and see what’s really different. Micronutrients (Less than 2% of): POTASSIUM HYDROXIDE, CALCIUM CHLORIDE, POTASSIUM PHOSPHATE, CALCIUM PHOSPHATE, SODIUM ASCORBATE, SODIUM CITRATE, CHOLINE BITARTRATE, 2′-O-FUCOSYLLACTOSE, M. ALPINA OIL, C. COHNII OIL, MAGNESIUM CHLORIDE, TAURINE, NUCLEOTIDES (CYTIDINE 5′-MONOPHOSPHATE, DISODIUM URIDINE 5′-MONOPHOSPHATE, ADENOSINE 5′-MONOPHOSPHATE, DISODIUM GUANOSINE 5′-MONOPHOSPHATE), INOSITOL, FERROUS SULFATE, ALPHA-TOCOPHERYL ACETATE, MIXED TOCOPHEROLS, ASCORBYL PALMITATE, CITRIC ACID, ZINC SULFATE, NIACINAMIDE, CALCIUM PANTOTHENATE, L-CARNITINE, COPPER SULFATE, VITAMIN A ACETATE, RIBOFLAVIN, THIAMINE MONONITRATE, PYRIDOXINE HYDROCHLORIDE, MANGANESE SULFATE, POTASSIUM IODIDE, FOLIC ACID, PHYLLOQUINONE, BIOTIN, SODIUM SELENATE, VITAMIN D3, VITAMIN B12, B. LACTIS CULTURES, SOY LECITHIN. Micronutrients (Less than 2% of): POTASSIUM CITRATE, POTASSIUM PHOSPHATE, CALCIUM CHLORIDE, CALCIUM PHOSPHATE, SODIUM CITRATE, MAGNESIUM CHLORIDE, FERROUS SULFATE, ZINC SULFATE, COPPER SULFATE, POTASSIUM IODIDE, MANGANESE SULFATE, SODIUM SELENATE, M. ALPINA OIL*, C. COHNII OIL**, SODIUM ASCORBATE, INOSITOL, CHOLINE BITARTRATE, ALPHA-TOCOPHERYL ACETATE, NIACINAMIDE, CALCIUM PANTOTHENATE, RIBOFLAVIN, VITAMIN A ACETATE, PYRIDOXINE HYDROCHLORIDE, THIAMINE MONONITRATE, FOLIC ACID, PHYLLOQUINONE, BIOTIN, VITAMIN D3, VITAMIN B12, TAURINE, NUCLEOTIDES (CYTIDINE 5′-MONOPHOSPHATE, DISODIUM URIDINE 5′-MONOPHOSPHATE, ADENOSINE 5′-MONOPHOSPHATE, DISODIUM GUANOSINE 5′-MONOPHOSPHATE), ASCORBYL PALMITATE, MIXED TOCOPHEROLS, L-CARNITINE, B. LACTIS CULTURES, SOY LECITHIN. So you don’t go cross-eyed trying to compare the lists, I have highlighted the ONLY differences in orante and blue. The orange ingredients show that the two formulas provide different PREbiotics. The regular “Gentle” provides the human milk oligosaccharide: 2FL, while the “For Supplementing” provides a more standard PREbiotic, galacto-oligosaccharide. The only other difference is the blue ingredient. Both formlas provide the same PRObiotic bacteria – B. Lactis. What you can’t tell from the label is that the “For Supplementing” just provides a higher dosage of this bacteria. That’s it. Those are the only differences ….. There you have it! Formula that is special for breastfed babies is just marketing hype! You should ignore all claims made on the front of the packaging or in commercials! The only thing that matters is the list of ingredients. If you’ve read all my articles, you’ll know what to look for in the ingredients and go into the grocery store armed with confidence. Any other thoughts or questions about marketing claims on infant formula? I’d love to see them in the comments section.